Beginning/intermediate level. The Blues have had the very essence of the jazz sound since the 1920's. A player who masters the sound and feel of the Blues will play other jazz tunes in a manner that will inspire the listener. The rhythm section on this recording really grooves and makes this set fun to play with. 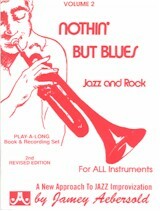 Contains 11 different Blues and is a natural follow-up to Volume 1 or Volume 21. The tempos are not fast. The Blues are presented in various keys and with a variety of moods from slow to rock. Chords and scales are written in the staff for each recorded track.